Escape the hustle and bustle and find yourself at peace with the nature setting this home has to offer. This .69 acre wooded lot presents the feeling of seclusion and tranquility. Enter in to find yourself in awe of the beauty this home possesses. Enjoy the clean lines and custom details! Home has three bedrooms, three baths and is approximately 3,050 square feet. The main level family room features a floor-to-ceiling stone fireplace with a solid pine mantel, a built-in media area, high vaulted ceilings with skylights and slate floors with inlaid maple leaf detail. Adjacent to the formal dining room is the living room with vaulted pine ceilings, Brazilian cherry floors and impressive two-story walls of windows bringing the outside in. With a modern fee, the kitchen has a double oven, large Subzero fridge and is open to the family room. Perfect for entertaining, the lower level walk-out has a large recreation room featuring a stone fireplace, limestone floors, wood ceilings and walls, a rustic staircase and a ¾ bath. 2404 Sherwood Hills Road, Minnetonka is located within the Hopkins School District. U.S. News & World Report ranked Hopkins High School #628 in their 2012 “Best High Schools” issue. Learn more about the Hopkins School District here. 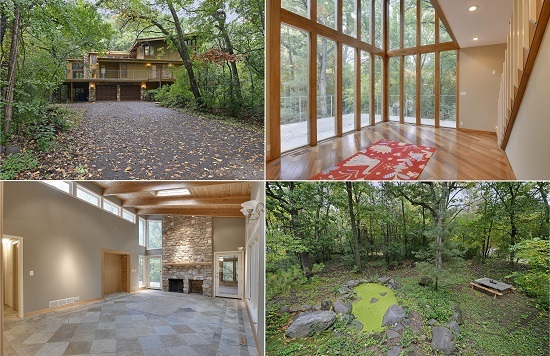 Browse all Minnetonka Homes here. Contact Shane Joseph for more information on 2404 Sherwood Hills Road, Minnetonka.